Baker Mayfield finally got a chance to play in a regular season game for the Cleveland Browns on Thursday night and impressed everyone by bringing his team back from 14-0 down to win the Browns' first game since 2016. Surely this makes him the starter over veteran Tyrod Taylor, right? Well, it's pretty clear what that "tape" is going to show. Taylor wasn't technically benched Thursday night, but he did have to be removed from the game with an apparent concussion. Mayfield rejuvenated the offense, and many of those who watched last night's game were probably expecting to hear a definitive starter label handed to Mayfield today. Mayfield went 17-for-23 with 201 passing yards while Taylor was 4-for-14 with 19 yards with a couple brutal underthrown deep balls that could have been touchdowns. 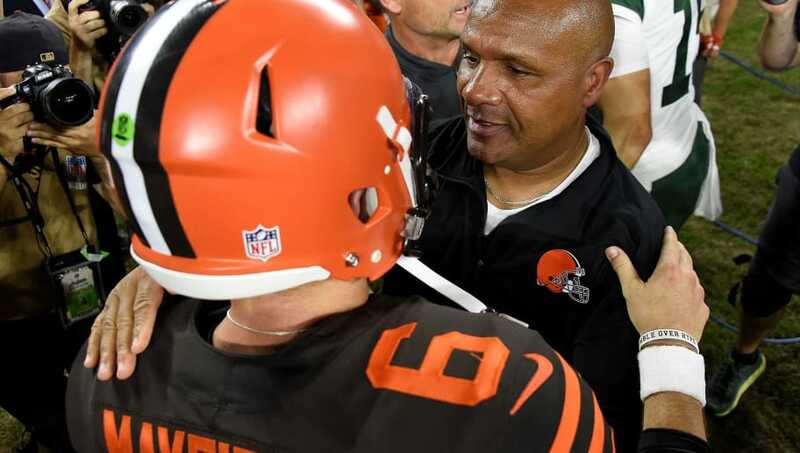 Jackson will reportedly talk to the team Monday to announce who the new Browns' starter will be then, but there's a lot of evidence pointing toward Mayfield after last night. Still, Jackson is doing his due diligence to go about the process the right way in order to not disrespect the seasoned-veteran Taylor. No matter what Jackson says in the coming days, it sure looks like Baker's team now. Get $20 with your first deposit on FanDuel. Join Now.